Never Smile at a Crocodile, but what happens when it smiles at you? 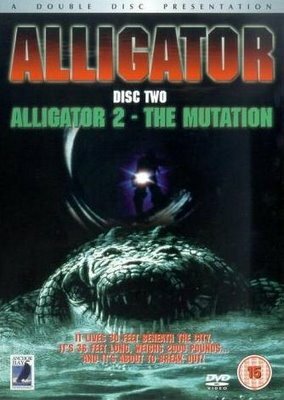 Alligator is a 1981 horror/comedy film, directed by Lewis Teague and starring Robert Forster and Robin Riker, with a screenplay by John Sayles, in which Chicago policeman David Madison has to stop "Ramon", the eponymous beast, who is running amok in the city sewer system after feeding on covertly discarded growth hormone. The film is notable for being among the first of the slew of Jaws homages/rip-offs to be produced by the American movie industry. Unlike 99% of the horrors that have come lurching along in its wake, the humor is intentional, the human characters are sympathetic, and the flick is worth seeing. A sequel/remake was released in 1991, subtitled The Mutation. Absurdly Spacious Sewer: As noted by the quote above, it has a mighty big alligator freely wandering around in it. Accidental Murder: One night in a party, several kids were playing pirate and decided to have the designated prisoner 'walk the plank' via the house's pool. After the mother called them to get back to the house, she turned on the pool's light, revealing that Ramon has been taking residence in the pool. The prisoner kid's screams of terror were mistaken as 'acting chicken' and he got pushed into the pool and devoured by Ramon. The pirate kids realized what's going on, and ran away in terror after realizing they just fed their friend to an alligator. An Arm and a Leg: While the alligator's mouth isn't big enough to help it swallow a human whole, he has enough biting strength to dismember humans for food, resulting in bloody messes. Antagonist Title: The protagonist is Madison. Attack of the 50-Foot Whatever: Aside from "Ramon", who's considerably bigger than any alligator (although not any crocodilian) ever gets, there's a carcass of a toy dog that was subjected to growth hormone experiments. It's the size of a St. Bernard. Ballroom Blitz: Ramon rampages through a high-society wedding. Big Bad: Mr. Slade, the Corrupt Corporate Executive indirectly responsible for Ramón becoming giant. Brick Joke: Because in the middle of the film, one of the heroes arrested a man for selling a baby gator for pet and telling the other cops to flush this gator. Children Are Innocent: Subverted; two of them push their unwilling friend into a swimming pool, although they certainly weren't trying to get him eaten. Also Madison has to deal with a pretty mouthy kid who witnesses one of Ramon's attacks. Corrupt Corporate Executive: Slade. He orders the experiments which thanks to illegally discarded test-animal corpses leads to Ramon becoming the menace he is. Cowboy Cop: Madison's reputation, even though it's not exactly deserved. Da Chief: A more sympathetic and intelligent version than usual. Death of a Child: On a dare, a kid jumps off the diving board of his backyard swimming pool at night while the alligator is momentarily staying in it. He realizes at the last moment what is happening and tries to step back, but his friends push him in anyway because they didn't see it and think he chickened out. Dirty Coward: A wedding attendant races to his limo and locks the door refusing to let in another attendant also trying to get in the limo. Neither of the attendants survive. Egomaniac Hunter: The ill-fated Col. Brock. Great White Hunter: Again, an overt parody in the form of Col. Brock. Here We Go Again! : The film ends with another alligator getting flushed into the sewer. Hot Scientist: Marisa Kendall, the reptile-expert/love interest who helps Madison in trying to kill Ramon. Intrepid Reporter: Subverted, in that the guy is an obnoxious jerk whom Madison heartily dislikes, but genuinely goes looking for scoops, eventually taking crucial pictures of Ramon, even as he is devoured. Improbable Infant Survival: A little girl toddler is in the back yard with her mother's wash. Mom hears the phone ring, goes in to answer it, and along comes the titular beast. Mom sees the monster leave the yard, and runs back out screaming and crying as she looks for her child. Then the little girl lifts up the clothes basket she was hiding under! Karma Houdini: The cruel doctor whose experiments turned Ramon into a monster in the first place gets off scott-free. Ditto the almost-certainly-abusive father who flushed him in the first place. Karmic Death: Ramon kills the Corrupt Corporate Executive whose experiments inadvertently created him. Motor Mouth: The Hot Scientist's mother. My God, What Have I Done? : The kids at the pool, not the one who's dead. They think it's just a prank, but the moment they see they've just fed their friend to a giant alligator, the sheer look of horror they have just screams of this trope. Never Smile at a Crocodile: Hi there, Ramon! Nigh-Invulnerability: Ramon is even bigger, stronger and better armored than a normal alligator, thanks to the aforementioned experiments. It finally takes a bomb to finish him off. Nightmare Dreams: Madison has these from his first encounter with Ramon. Not Worth Killing: Played With. Ramon devours his victims most of the time. The deaths of Mr. Slade and his assistant? Ramon didn't even eat them, despite eating most of the guests; he just contents himself with smashing the assistant to the car until he died out of blunt smashing wounds, and smashed the car with Slade being squeezed to death inside. Pet Baby Wild Animal: Subverted. Ramon gets unceremoniously flushed into the sewer while still tiny, and his former owner then makes every effort to help kill him, Of course, she has no reason to even know it's the same alligator. Police are Useless: The alligator has bulletproof skin and can easily hide in the water and even destroys an entire boat full of policemen and their grenades just by tripping it. Sewer Gator: The film is about a deadly giant alligator killing humans in the sewers of Chicago. Shout-Out: The graffiti in the sewers, the name of the sewer-worker Ramon kills. Suspiciously Stealthy Predator: Because it just wouldn't be a Jaws ripoff if the beast let anyone but the hero realize it was out there too soon, would it? Talking the Monster to Death: Sarcastically suggested by the Hot Scientist, in reference to her motor-mouthed mother. Karmic Death: The Corrupt Corporate Executive, whose casual dumping of toxic waste into the sewers created the giant alligator, is accidentally pushed into the lake and is soon eaten by the beast. Magic Countdown: Hawk leaves dynamite with timer on it in the sewer for the alligator, and hurriedly climbs back to the surface and warns other about how they have only ten seconds and they all scramble or safety. Cut back to the dynamite, which has noticeable amount of time left in the timer. Possibly he'd lost count, or was exaggerating to get the others moving quicker. Numbered Sequels: With Electric Boogaloo. Stock Footage: Uses snippets of footage from the first film's alligator sequences in some scenes. Toxic Waste Can Do Anything: While the first Alligator gained its giant, mutated form by eating discarded animal corpses spiked with growth hormones, the one in the sequel was exposed to toxic waste, which worked just as well.